Wireless security is connected with the protection of device like computers, laptops, mobile phones, tablet which is attached with external network. How can we control threats and vulnerability of external network with our connected device is the main aim of wireless security. Wireless communication is done on air with respect to different devices Like WI-FI, Bluetooth, satellite communication & mobile communication. This is very common communication aspects which is used by everyone now a day’s but there are certain elements which are used as maintain security of LAN (Local Area Network). Network security is one of the major concern of all the organization whether it is small or large. First element we can say that the design of your wireless network. How the Wi-Fi network plan will be effective and beneficial that must be discussed. Strategic planning for what types of device you will require and how many it will require. Second thing is detail analysis about the capability of your wireless device. It is always good to do validation testing for your design as it will be more helpful or not as per your plan. Third thing is work with right wireless service provider. A good wireless device will serve you the best quality which will enhance your business Objectives and goals. Afterwards we can move with some facts by which we can protect wireless security by discouraging unauthorized person, by preventing unofficial connection, by protecting data while it will transfer through encryption. There are available solution for wireless LAN security like WPA (Wi-Fi Protected access), WPA2 (Wi-Fi Protected access 2), VPN (Virtual Private Networking), WEP (Wired Equivalent Privacy). It will be discussed in further articles. Wireless access is being deployed in office as well as in public environment and home. There are some basic wireless technologies. We will discuss same in detail. Wireless Local Area Network (WLAN): This technology is using high frequency radio waves to transfer and communication of data between attached network devices. Access point: Access point is hardware device which allows wireless communication in devices. For example, PDA (Personal Digital Assistance). It combines computer and internet networking features. PDA can function as fax sender. 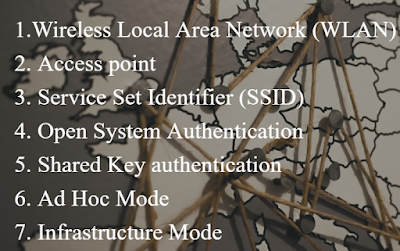 Service Set Identifier (SSID): This provides basic configuration between wireless clients to communicate with proper access point. Only clients who have valid SSID, They can communicate further. SSID work as single password between two access points and clients. Open System Authentication: This is authentication protocol provides 802.11 standard. It is combination of authentication request and authentication response. Authentication request contains station ID. Authentication response contains success and failure data. If response is successful then we can say that two nodes are authenticated. For providing better security, wired equivalent privacy protocol have been used. This protocol is used for encrypting the data. Shared Key authentication: By using WEP (Wired Equivalent Privacy) and secret key, authentication between two devices have been done with shared key authentication. It works with challenge and response mechanism. WEP encrypted the challenge text using shared secret key and client have to return the encrypted challenge text for access point verification. If access point will decrypt then and only then authentication is accepted. Ad Hoc Mode: This is authentication protocol provides 802.11 standard. Ad Hoc Mode contains minimum two wireless station where no access point is involved in their communication. It is less expensive as access point is not needed here for communication but we can’t use this topology for large network. Even this authentication process is not that much secured as it does not have access point. Infrastructure Mode: it is advance from ad hoc mode and also provides 802.11 standard. Infrastructure Mode contains number of wireless station with access points. Here access point is connected with larger wired network. This topology is used for building large number of network with more complexity and arbitrary coverage. WI-FI: This is very common now a days, Wireless Fidelity (Wi-Fi) is available for home, office, mall, game zone etc. Wi-Fi also operates with 802.11 standard. As we have seen this standard is used by almost all topology so security research for same is important subject. There are many wireless clients are available like smart watch which is connected with smart phone with Bluetooth. Laptop is one of them too. Access Points: This is the central point for 802.11 standard implementation. It is connection point between wired and wireless device. Here Data can be exchanged via different wireless device. But these wireless devices must be authenticated by access point. We can take example of router as an access point. Wireless Controller and BTS: Wireless controller have numbers of access points. It works as a centralized server which have IP connectivity for all access points. BTS (Base Transaction Session) is widely used for providing network to all mobile operators. Different types of network companies have BTS for proving best coverage of their network.